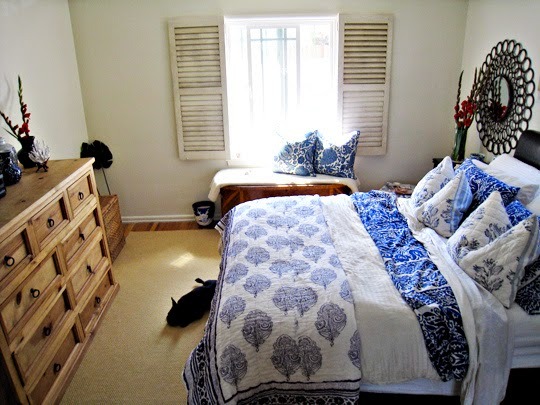 When I get round to sprucing my place up, I often like to start with the bedroom; it's where you start the day, after all, so a beautiful environment to wake up in can only be a good thing! Here's a look at some of this season's trends and ideas for updating your bedroom. The bed is a great place to start, especially if yours is feeling a little tired. Most people are aware of the importance of a good night's sleep these days, and a new bed doesn't have to cost the earth. One idea to consider if you're changing colour schemes, leaving you with soft furnishings and other clutter that you don't really want to chuck out, is an ottoman bed. The mattress lifts up to reveal a storage area underneath, useful for extra pillows and the like - or anything else you'd rather not have on public display! Bedstar have a good range with plenty of options in neutral colours. Colour scheme choices are particularly important in the bedroom. For some people, relaxed, calming tones make it easier to get to sleep, while others like a more vibrant palette to help them get going in the morning. Mixing the two doesn't often work! You probably don't want to be redecorating every six months, so it's worth taking a tip from the luxury hotel chains if you're in doubt; neutral, calming tones seem to be most popular with those who run businesses based on keeping sleepy customers happy. You can always jazz the room up with colourful pillows, lampshades and so on. Natural fabrics are always popular; Sainsbury's "Indigo" range, new for autumn, includes bedding and soft furnishings in deep but relaxing blues. If you fancy a warmer, more rustic scheme, that's another way to go this season while staying fashionable. A couple of items of weathered oak furniture - say a chest of drawers and a nightstand - can look wonderful in a rustic themed bedroom. The Cotswold Company have a nice range of oak storage pieces, including small units that'll fit in an alcove. Tartan is looking like a popular theme this season as well, so a blanket or a few cushions can be deployed to give a splash of colour. Terry's Fabrics have ideas for both bold red tartan styles and more neutral, beige toned versions like "Balmoral Rosso". Ultimately, the bedroom is perhaps the most personal room in the house, and how you choose to decorate it is down to you; but remember that clean, calm, uncluttered design will generally assist with a better night's sleep, whether you go for bright, "morning-person" colours - or the other way! *In collaboration with Slap Up Media.